If ever a title gives away the contents of the book, it's this one. Brian McLellan promises blood, and blood he delivers in spades. The story begins with a coup d'etat (straight out of the French Revolution, with all its attendant savagery and gore). In a bold move, Field Marshal Tamas, a powerful powder mage, (literally) guillotines the monarchy and kills off the corrupt cabal of sorcerers who upheld the King's rule. Tamas and his small cadre of powder mages overthrow the political system, leading Tamas to declare "The Age of Kings is dead... and I have killed it." But his great victory is haunted by a counterrevolution, internecine struggle, and an important but nebulous mystery: in their dying breaths, each member of the royal cabal Tamas had assassinated whispered, "You can't break Kresimir's curse." Worried about the implications of their dying message, Tamas sends Adamat, a police investigator with a special Knack of a perfect memory, to investigate. At the same time, Tamas also sends his son Taniel (a talented powder mage accompanied by a "savage" girl, Ka-Poel) to track down an uncommonly powerful member of the royal cabal who escaped assassination. Gradually, Tamas begins to realize that his revolution has triggered a series of events that may change the world forever. Promise of Blood is Brian McClellan's debut novel and the first book in his Powder Mage Trilogy. It is on the whole a fast-paced, enjoyable, and well-written dark fantasy, one that finds similarities not only with Brandon Sanderson's Mistborn series, but also with the recent trend of grit or grimdark in high fantasy. 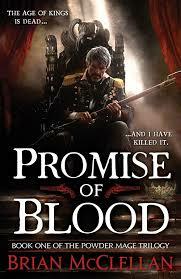 The sheer brutality featured in Promise of Blood at times reminded me of Joe Abercrombie's First Law trilogy. Thus fans of the grittier turn in the genre will find much to appreciate in McClellan's debut. One of the most interesting aspects of this book is its three overlapping magic systems. First, powder magic. With this, McClellan is taking a page (or a chapter) from Brandon Sanderson's Mistborn series. The similarities with Mistborn's allomancy are striking. Powder mages can consume gunpowder, which gives them heightened abilities and senses and dulls pain. Powder mages can use their magic to explode gunpowder, float bullets, curve them around difficult to reach areas, and aim with superb accuracy. Second, the Else. This is a more traditional magic used by members of the royal cabal and the Predeii. It involves manipulating "the Else," the energy that surrounds us in our world. And sorcerers must put on their special rune-based gloves in order to do so. These first two overlapping magic systems create an interesting tension between the upstart powder mages and their traditional royal cabal rivals. Third, voodoo...? Ka-Poel, the "savage" who accompanies Taniel, uses a special type of magic (that McClellan leaves unexplained) that involves the use of dolls and other organic elements associated with voodoo. McClellan is firmly entrenching himself in the "grittier," darker tradition of recent fantasy, and at times it feels as if his writing uses brutality for no other purpose than shock value. Now I am not opposed to brutality, gore, and death. I have had no difficulty getting through even the most brutal scenes of Steven Erikson's Malazan Book of the Fallen... after all, the brutality in those books serves an overall purpose. But at times, Promise of Blood seems to use violence for shock value. This is something we at Nerds of a Feather have complained about in the past (I won't belabor this point, but if you are interested see here). McClellan's weird fascination with severed fingers, in particular, highlights this point. Promise of Blood also suffers from rather weak treatment of women. Adamat highlights his world's pervasive misogyny when he thinks: "Damned woman. What he'd give for an obedient wife." This is not a problem in itself. People can be misogynistic in the real world, so it is understandable that characters in a fantasy world may be as well. But McClellan does not complicate his world's misogyny through the introduction of nuanced and strong female characters. Granted, his female characters (the Predeii and Ka-Poel) wield perhaps the most powerful magics. But his female protagonists (and antagonists) all are annoyingly weak in some way, have sordid pasts, or lust for power. Nila is a weak and indecisive maid/laundress, one who keeps finding herself thrust into situations she cannot influence. Vlora, Taniel's fiancee, is talented in powder magic, but weak in resolve (she cheats on him before the story begins) and spends most of the time off camera. And Ka-Poel may be powerful as well, but she underwent unspeakable abuse in her past, abuse from which Taniel saved her. Finally, the story seems to wander at times, and not all the story arcs fit together. The Nila story arc, in particular, feels directionless, lacks sufficient tension, and does not fit with the book's overall tenor. I suspect that Nila will play a much broader role in the upcoming books, but her story fell flat in this first volume. In the end, McClellan has crafted a new fantasy series that will appeal to (and will find a strong audience in) young male readers. Although it remains to be seen where he will take his Powder Mage Trilogy, I doubt that I will stay on for the ride. Bonuses: +1 for his interesting and overlapping magic systems; +1 for Adom. Penalties: -1 for a pervasive misogyny; -1 for his weird fascination with severed fingers; -1 for the Nila story arc.